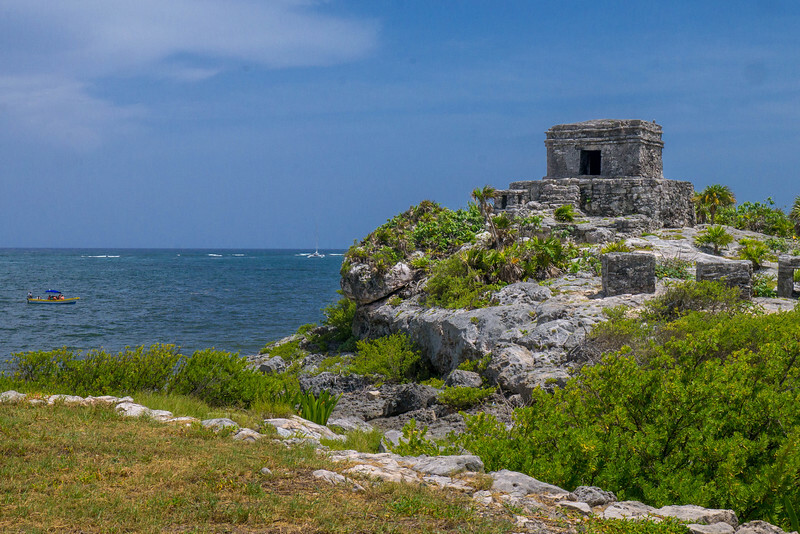 Jutting from the eastern edge of Mexico, the Yucatán Peninsula is a popular tourism gateway to Mexico. This region has an extensive tourism infrastructure, all spanning outward from Cancún. Though Cancún has sticky connotations as a party destination for spring breakers—and it has an overpriced, glitzy hotel zone—the city is merely the starting point to one of my favorite regions in Mexico. The Yucatán is safe from the cartel violence associated with other Mexican States, and it’s home to some of the country’s richest history. The area houses arguably the best preserved Maya ruins, internationally acclaimed dive and snorkeling sites, gorgeous Spanish colonial cities dripping in history, locally run cooperativos offering responsible tourism projects, and densely inhabited animal biosphere reserves. In a word, it’s wonderful. I’ve traveled this area several times, most recently with my two young nephews (10 and 11) for a monthlong road trip around the Yucatán Peninsula. This is an overview of our route and all the nitty-gritty details of things to do, places to stop, what to eat, and more. Although you might change-up the activities if you are a couple or solo traveler, the route is solid and would make a wonderful two to three-week trip. Read on for the city guides and personal recommendations for this region of Mexico. Maya history is a major draw for tourism. Stunning architecture and reliefs carved into the stone temples bring to life a fascinating, violent, and advanced ancient culture that managed to develop the only known pre-Columbian writing system in the Americas. Much of the land in the Yucatán Peninsula was once the Maya lowlands. The Maya empire dates back as far as 2400 BC and spanned throughout present-day Guatemala, Honduras, and Southern Mexico. Throughout the large sweep of land lies a vast network of massive temples and ancient cities; only a small part of the these ruins have been excavated, many still lie under the tangle of forest. Several famous Maya archaeological sites are within the Yucatán, Riviera Maya, and Chiapas regions, including Chichén Itzá and Tulum. The Maya history is a major draw for tourism, with the stunning architecture of the temples and reliefs carved into the stone bringing to life a fascinating, violent, and advanced ancient culture that managed to develop the only known pre-Columbian writing system in the Americas. Present day, the Yucatán’s unique limestone base gives the area one of its most famous draws: the beautiful sinkholes and underwater rivers. The Maya used these sinkholes, known as cenotes, for sacrificial offerings, but today they dot the entire region and offer travelers the chance to cool off in the crystal-blue waters. Because of this region’s limestone base, rivers are mostly underground and they connect a large network of caves and swimming spots. The History Channel has a fuller history of the Yucatán detailed here, and more about the Maya civilization here. Water: Not safe. Drink bottled or use a SteriPen. Local SIM: This is a cinch and highly recommended for GPS and navigating. Telcel is likely your best option. If you have a U.S. T-Mobile account, it will do the trick too. Full SIM guide here—note that you will likely need to show your passport. Food Considerations: Food standards are high in this area as tourism is the primary income for many. The water is not safe to drink, but bottled water is easy to come by. Street food can be scarce in touristy areas, but is tasty and delicious. If you decide to stick to budget and street food options, follow these food safety principles. Accommodation: This is a cinch. I used a Lonely Planet guide when my nephews and I were in a pinch. While the links in city guides below go to a hotel booking site, many are also found on Airbnb if you are member. (A Little Adrift readers get a $20 Airbnb credit here to give it a go.) It has a very established presence in this region of Mexico and is an easy way to book nice spots in a good area of town, while getting out of the hotel scene. I don’t use this as often when I am solo, so it was neat to have a reason to pick some great local apartments for my nephews and me. For backpackers, the main hotel booking sites now usually list hostels, too (with no booking fees), or use Hostelworld; in high season the bigger towns book up fast. Families should consider Booking.com. And if you buy a local SIM (which you should), you can easily call ahead and directly reserve spots en route. If none of these will do, check out my detailed guide to finding good places to stay. Transportation: The major roads are well-maintained and connect most any place you’ll need to go. In the center of the Yucatán, some of the cenotes are a bit further off the path and visiting them means winding through tiny towns and backroads. Otherwise, large and well-paved highways connect the major cities. The Ado bus network is extensive and ideal for those on a budget. These buses are large, comfortable, and affordable. Rental cars are easy to come by, though expensive to rent—they tack on huge fees and taxes to the offered price. Here is the lowdown on everything you need to know about renting a car in Mexico. Possible Issues: Not many. Though a few regions of Mexico have cartel violence and safety concerns, the Yucatán has a thriving tourism industry and works hard to preserve it. Likewise, small bribes of the sort that works elsewhere in Mexico are iffier here. Best to just drive the speed limit and follow the laws. The People’s Guide to Mexico: Even veteran Mexico travelers will enjoy this book. It’s like a guidebook, but even more. It’s hands-down the best guidebook you should use to understand the various regions, the cultural quirks, and all the reasons Mexico is a fantastic place to travel and live. It comes highly recommended by me, and by heaps of Amazon reviewers too. Time Among the Maya: This is an in-depth longread about Maya culture, history backstory of the entire region. It’s likely something you want to read before leaving as it’s not a travel guide. The Maya Sites – Hidden Treasures of the Rainforest: This book is the perfect road-trip companion for anyone exploring the Yucatan, but also Maya sites in Campeche, Chiapas, and into Guatemala. It’s not a straight-up travel guide, but rather a companion you can use for a history and overview of the temples as you explore, as well as personal recommendations from the author of his favorite parts of each Maya site. Recommended Guidebook: Lonely Planet Yucatan. We used this one entire time and it was fun to let the kids read aloud the history of each section as we drove. Having a paper guidebook also allowed them to browse through and pick activities in the area. That said, since then I’ve read The Maya Sites guide, and it’s like having a passionate traveler along in the car sharing quick tips on routes, as well as the best parts of history. I recommend the LP for specific recs and routes and timetables, and the Maya Sites guide as your companion for history and temple exploring. Find more regional fiction and nonfiction books and long-reads and you can read all my Mexico travel stories. As noted, I took a road trip of the Yucatan Peninsula with my two nephews, and it was an epic adventure. I have also traveled the region solo as a backpacker on a budget, and it’s just a lot of fun no matter how you go about it. The city guides below combine my advice across several trips, while also highlighting those places where I stayed with my nephews, meaning they are family-friendly options! The charming cobblestone streets of Izamal. Feeding turtles at the Isla Mujeres turtle farm. Ziplining through Xplor Park in the Riviera Maya, near Playa del Carmen. Galloping down an old railroad track to the gorgeous cenotes in Cuzamá. Wandering the Maya ruins of Chichén Itzá and Ek Balam. Most trips will start here as it’s the main international airport and the easiest place to rent a car, or line up buses to explore the region. That being said, unless you’re into the party scene, you will likely just want to get in and out. There are far better spots to do most anything Cancun has to offer. Playa Delfin: Good family friendly beach if you have time to pass in the city. We spent an afternoon splashing in the waves here. The beach was clean, clear, and relatively shallow. Good parking and the kids enjoyed, but the waves were too strong for very tiny kids. Walmart: Not gonna lie, we stayed in Cancun so briefly. We used it as a base to stock up for our trip with a case of water, snacks, snorkel gear, hats, and then we hit the road out-of-town. Airport adjacent Airbnb: We stayed at this fantastic rental the night before our flight and it perfectly served our needs. It’s best if you have a car as it’s outside the city. The amenities make it amazing for families with kids. (If you’ve never used Airbnb, you can receive a credit here to give it a go, I recommend highly!). Hostel Ka’beh: Has a nice vibe, though a definite party backpacker atmosphere. I’ve stayed here several times over the years for a cheap bed and good company. It wasn’t great for families though. Cancun International Suites is a good midrange option located near the city centre. If you’re looking for a high-end hotel near the beach try Beachscape Kin Ha Villas & Suites. Parque de las Palapas: Great street eats here and a lot going on every night, from food, snacks, and carnival games to dance shows on the main stage. This is a great stop for singles, couples, or families. The island has beautiful beaches and a Turtle Farm doing amazing conservation work. If you’ve already rented a car, leave it at the docks in a secure garage (was a cinch to find) and take the ferry over. You can rent a golf cart on the island to easily get around. 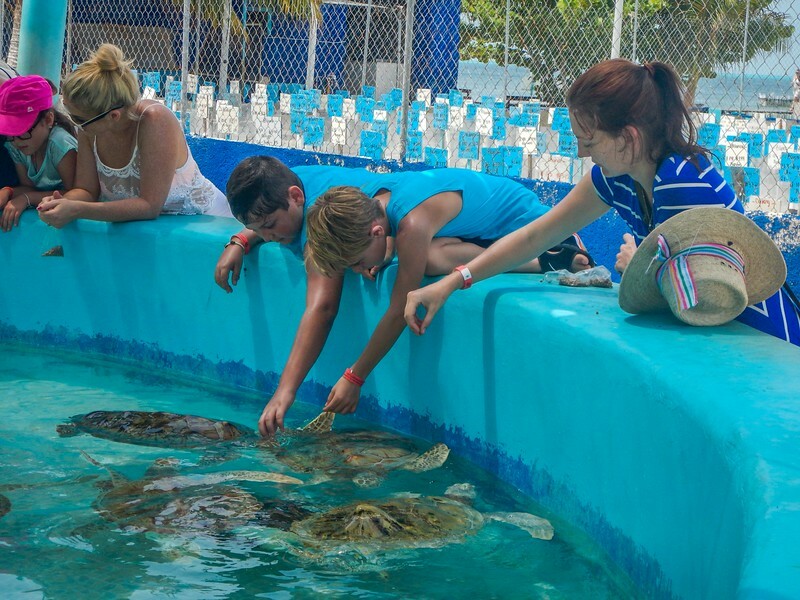 Turtle Farm (Tortugranja): One of the clear highlights of our entire trip. My nephews raved about it for weeks. There are little turtles they can often touch, pools of turtles in varying stages, and a good message about conservation. You can get a taxi out to it or rent a golf cart or scooter for the day. They breed and release thousands of sea turtles, was great as a family, kids loved feeding turtles and seeing all the different colors and types. Rent a Golf Cart: Drive around the island for a day or two and explore some of the points on the opposite end of the island. Makes for a full day adventure if you bring swimming gear and plan to explore and have lunch at the expat/local spot in the center of the island. Playa Norte: Incredible clear and shallow waters. This beach was a hit with my nephews and the best beach for kids we saw on our entire Yucatan road trip. Apartamentos Trinchan: Include small kitchen and suites big enough for four people. Very comfortable and convenient spot on the island with a fantastic coffee shop next door. We called and booked our apartment. Poc-na hostel: What a gorgeous spot and so much space. We didn’t stay here but our apartment was next door and I’d stay here if I was solo. Manana: Delicious guacamole and incredible fresh juices. WikiTravel: Lists out the best restaurants on the island. Though this stretch of beaches in the Yucatán is best known for huge, sprawling resorts, it’s popular for a reason—the beaches are gorgeous and there is a strong tourism infrastructure. I recommend a few days here to visit some of the hotspots like swimming with turtles and amazing snorkeling. If you’re visiting for the party scene, Playa del Carmen has leapt onto that scene in recent years. The theme parks near Playa del Carmen are a perfect kid activity (or fun with a group of backpackers!). My nephews and I visited Xplor (review here) and loved it. If we ever go back we’ll surely try out Xcaret or Xel Ha next time. Ferry over to Cozumel and dive at the best dive spots in the country. This island is the mecca for cruise ships, but for good reason. The snorkeling and diving is fantastic. Consider a food tour of Cozumel or Playa del Carmen. Cozumel Chef has rave reviews for cooking classes and food tours in the area and would make a great outing. Snorkel with turtles at Akumal. On the way to Tulum, if you start early you can hit up this small beach community (about 20 minutes south of Playa del Carmen). Organized tours arrive by 10am, so arrive well before then to slip into the water and swim with sea turtles. Seaside Maya ruins at Tulum. Miles of white sandy beaches near Tulum make this a popular backpacking stop. We just came for the ruins, and they are very pretty and sunny—bring a hat! My nephews and I stayed for one night but decided we had enjoyed the gentler waters of Isla Mujeres better, so we moved inland. Coba ruins. If you have active kids this might be a better stop as you move inland as it’s impressive, less touristy, and you can bike to the ruins and then climb them for sweeping views of the jungly region. Vainilla Bed and Breakfast in Playa del Carmen. We just loved this little spot. It’s in a non-touristy area with food and shops walkable, and a longer walk to the beach is possible. We had a rental car so it was nice to have a spot away from the hustle. Highly recommended, the woman who runs it is delightful and the homemade jams at breakfast were so delicious. Hotel & Cabanas Zazil Kin in Tulum. We spent a night here and it was affordable and directly on the beach. You’ll have to splurge for A/C, but it’s an easy walk to the ruins and makes for a nice spot with kids. My nephews played in the sand right outside our bungalow door. You’ll want to spend at least two nights here as there are several nearby cultural activities, and the town itself is beautiful. There is an old, historic charm to Valladolid and it’s very photogenic. There are also great places to eat and try a variety of Mexican foods. Chichen Itza: The major site for most travelers. It’s a large complex with a variety of Maya ruins. Make sure you either have a guide or eavesdrop on a guide at the ball court, as the explanation of the acoustics there is fascinating. This is a good online guide to the temples you can explore. Ek ‘Balam: Our favorite of the ruins in the area. Although Chichen Itza is the clear draw, Ek ‘Balam is far less touristy and you can climb to the top of the pyramid and see far over the jungle canopy. The site also has some gorgeous restored carvings that give a glimpse of what it might have been like at the height of the Maya empire. Cenote Dzitnup: There are two cenotes in this complex and both are beautiful and a great way to cool off for the afternoon. Catedral de San Gervasio: Gorgeous cathedral on the main square that makes a nice backdrop to evenings spent in the plaza central. La Candelaria Hostel: This place comes highly recommended for backpackers. They don’t accept children so it’s not ideal for families. La Aurora Hotel Colonial is a good midrange option. If you’re looking for something more high-end try Hotel Posada San Juan. Street Food: In the main square kitty-corner from the cathedral is a cafeteria type area with tiny restaurants offering niche Mexican eats. We used this for both breakfast and dinner several times. 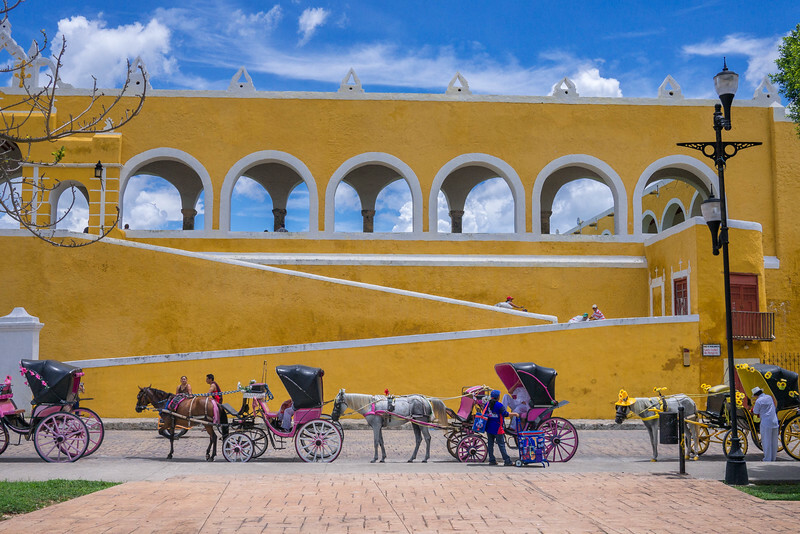 All of us agree, there’s something special about Izamal. If we had only used our guidebook, we might have skipped this tiny, sleepy, yellow Mexican town. But I turned to my friend Wandering Earl for travel planning advice — he lived in the region for years—and he said this was a must-do. Though we thought to spend just two days here, our hotel was great and the town was easy so we instead spent four days doing little more than playing with new Dutch friends and eating street eats in the central plaza. Plus it’s on the tentative list of UNESCO World Heritage sites in Mexico, so you know it’s going to be interesting. Kinich Kakmo Pyramid: An easy walk in the town and it’s not too strenuous to get to the top and see the town laid out below. If you rent a horse carriage, this is one of the places they visit. Izamal Monastery (Colonial Franciscan Monastery of San Antonio de Padua ): Fascinating, huge, and unique in the world. And, of course, it’s gorgeously yellow. Wander: Really we just walked the town with ice creams in hand and it occupied us for the day. Hotel Macan Ché: We stayed here and it was thoroughly lovely; they have a very neat cenote-shaped pool where the boys lived for four days. If you’re there in the off-season you could try your luck without a reservation and likely get a slightly better rate. Hotel San Miguel Arcangel: This is well located, right on the main square and looking out over the convent. It’s a good, basic but clean option that makes a good spot to explore. Street food in the Mercado Municipal: There aren’t a heap of places to eat, but then there are a few street food carts every evening in the town’s central park. The boys lived for the pork sandwiches from the cart right in front of the monastery. Eat early as the town closes down early and you will be hungry if you wait too late. Kinich El Sabor de Izamal. (Calle 27 #299, between Calles 28 & 30) A good range of Mexican dishes and we all enjoyed what we ordered. El Toro Restaurante. (Calle 33, between Calles 30 & 32) Close to the main square and makes a good spot for lunch or dinner. As you head into this region of the Yucatán Peninsula, the pace tourism drops off a bit. Mérida is known for its language schools, but also for its stunning colonial streets and walkable city center. After leaving Izamal, we stopped at the cenotes of Cuzamá for an afternoon and it was fantastic—then we crashed in Mérida that night. From Mérida, it’s an easy drive to one of the two biosphere reserves in the region. We opted for Celestún, which is a beach spot for Mexican vacationers more than tourists. The Celestún Biosphere Reserve is the real reason to come, which is home to thousands of mating flamingos. Alternatively, you could venture to Rio Lagartos to see the flamingos as well. Pass an evening in the Plaza de la independencia in Mérida, it’s magical. 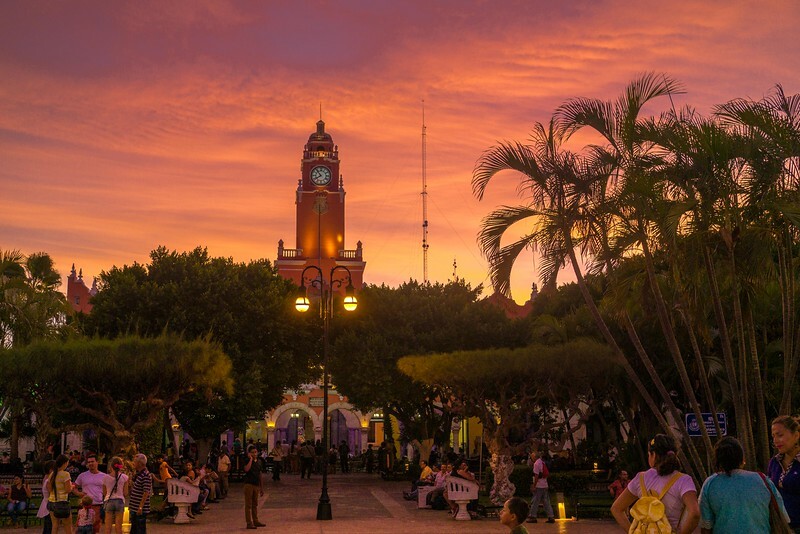 The historic colonial streets make for pretty explorations, but for traveling with kids this plaza hums with life as the sun sets. My nephews were endlessly entertained with the vendors, the other kids, and the sweet treats. The Big Museum of the Maya World in Mérida. This is a good place to tie together many of the themes and history from other parts of the trip. It has a wide range of activities and exhibits. Take a horse-drawn cart to the three cenotes of Cuzamá. Use the map to find Chunkanan, which is where the horse-drawn carts leave for the cenotes. It’s about 10 minutes outside of the town of Cuzamá. Make sure you go all the way to the end of the road to the right CBO (community-based org). There is a different group that will try to flag you into their parking lot, but keep going so that you are spending your funds with a responsible local business fairly and ethically supporting the surrounding community. This site has a long list of other kid-friendly activities in the region. Visit the Celestún Biosphere Reserve. Hire a boat from the collective on the beach and speed through the ocean and into the wide river expanses. Wear a bathing suit as you’ll have the chance to take a dip in some clear blue waters. Hotel Santa Maria in Mérida. This spot worked out perfectly, it was very affordable and close to everything. The rooms were basic but clean and had A/C. They also have a pool and free parking. I’d stay here again. Gutierrez Hotel & Restaurant in Celestún. This place is right on the beach and we enjoyed it. The restaurant attached is great, and I loved that I could sit in the shade while the boys dug in the dirt. We called and booked via telephone.